This morning I made the Monster Marshmallow Cookies from Food Network Magazine. If you haven’t seen the recipe yet, it’s one of the most creative and imaginative contest winners I’ve seen this year. 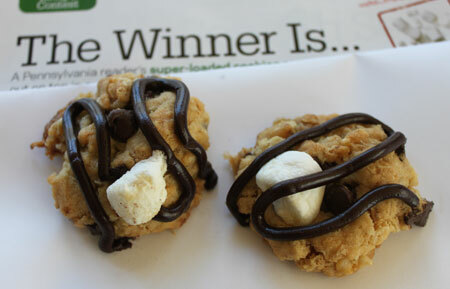 Interestingly, the category in which it won was not cookies, but rather Food Network Magazine’s “Secret Ingredient” contest where they give you an ingredient (in this case, marshmallows) and you have to come up with a recipe that’s creative and that people might actually make. This one’s definitely tempting! As soon as the magazine posts the recipe I’ll add a link. As of this writing, I couldn’t find it on-line anywhere and since it’s hot off the press I’ll wait for it to get around a bit or see if I can get permission. Updated: The link has been added above. The magazine is worth buying, though. It’s light and entertaining without being hokey — kind of a cross between a mainstream feature magazine and food magazine with focus on Food TV celebrities. Plus they give you a little booklet with 50 recipes in each issue. Anyway, I do apologize for not posting the recipe yet. If you absolutely have to have it now, though (say your have marshmallows, rice krispies, cayenne, oats and a big chocolate craving), email me. Marshmallows on cookies!? That sounds indulging. I think I already now what for our midnight snacks while watching our favorite movies. Hmmm! I can really feel the smooth but crunchy cookies of yours while I’m looking in your photos. LOL. I will surely make some of this for my cookies and of course for me too. Not knowing that you’ve added the link, I bought a copy of the magazine. I paged through it before the purchase and partially bought it because the winner is from Lenhartsville, which is only 15 miles from my home. Woo hoo! Thanks for the heads up, Sheri! I added the link. That’s probably one of the few food magazines I don’t get. I should maybe give it another look! The cookies are really good! They’re fat, crunchy on the outside, chewy inside, lots of textures from the cereal and oats (I used old fashioned) and marshmallows and pretty. I have the magazine and saw this recipe. How were the cookies? I saw the receipe and was debating if my kids would like them or not. Thanks for the information, I’ll keep my eyes peeled for this one. I just figured out what is for dinner, so I’m going to go make the cookies now. I was encouraged this morning when I realized I had everything needed already. It’s April — the one with the big sandwich on the cover. Subscription just came in the mail a few days ago and it’s April 2011. I’m sure they’ll have April recipes up on the site soon. Which issue is this in ?? I really like FN Magazine. It’s one I have a subscription for. I have made a number of recipes from the 50 Best insert on all kinds of things. And my son just asked me yesterday when we will ever have deviled eggs–I hadn’t seen the article until this morning. Now it will be hard to choose. Girlfriend, I could take a photo and show you that I literally had this recipe open and ready to make these cookies today after seeing them while I was working out on the treadmill this morning. Great minds. Anna, love your website! It’s my favorite! My husband yells at me because he complains about the constant lack of computer paper in the printer. I’m always printing your recipes! Would love the recipe as I have all the ingredients!! Thanks!!! I love the tag line! were they good? The name of these alone was enough to grab my attention! Yum! Karen, now that I know people actually read those “continue reading” tags, I might as well change them all to something entertaining. Glad you like the new look. I just switched themes and this new one has more options. Also, my search box works now. Jen, they feature a pretty good cross-section of their talent. For every celeb you don’t like, there’s probably one you do. For instance, in this issue there is a two page fold with 12 deviled eggs, split. Each photo represents a different recipe from a different celeb so you can have fun comparing, oh, Tyler Florence’s Lobster Deviled Eggs to Melissa d’Arabian’s Ranch Deviled Eggs. And I have to say, Claire Robinson’s Spanish Deviled Eggs with smoked paprika on them are looking pretty good to me right now…..
I’ve been tempted to buy this magazine but I’ve been worried it would be just one big advertisement for the Food Network and would feature the food celebs I least like. These cookies may just push me to pick up an issue. When I saw world of disappointment I assumed the cookies were a dud! Anyways, I’ve been meaning to tell you that I like your new look, now that I’m used to it. Sue, I try not to post photos without recipes but I couldn’t wait! I have typed it up the adapted version for those who need it right away. Jennifer, maybe I should change it back. I figured “world of disappointment” was overly dramatic for not being able to get a cookie recipe. Maybe “click here for slight disappointment” would be more appropriate? LOL “Click here for a world of disappointment” Notice I clicked, despite your warning! I’m with Sue, the recipe sounds interesting, but I can wait. I have a head cold anyway, so I probably shouldn’t be baking anything for anyone. At some point I definitely want that recipe but I can wait. Without any marshmallows my rice krispies, cayenne, and oats will have to wait until another day anyway. Thanks for the heads up about that magazine. I’ve heard of it but haven’t paid any attention to it.